Pass thehttp://4.bp.blogspot.com/-BQkG2GG8xyo/UBSxrx_OVzI/AAAAAAAACfU/oTJ-PC_BZ Slipped Stitch Over: etc. etc. A bitty post today with no real cohesive theme. Today I went to Sp*tl*ght at Birkenhead Point. I am still after blinds for my two bedrooms and they had yet another sale announced a day or so ago. The only ones I liked were custom made and I'm beginning to think I might have to go down that track. I've been looking in various sites and online for a couple of months now and not been satisfied. To my surprise, I was over an hour in the shop. I came out with three lots of material for summer tops for me. Nothing special, just something cool and fresh for this summer. That's the problem with stocking up at the one time on clothing. It wears out at the same time. I also looked at sewing machines. My Husqvarna is over fifteen years old. It hasn't had a great deal of use for the last five years. It was expensive when it was bought in 1994, about $900, and it comes with some baggage. I realise now it was a guilt offering, bought to assuage the guilt my then husband felt about something he had done. Now I realise that's something I have to deal with. It's really my baggage. I have done some research and see that that brand and several others all come now from the same stable. I wasn't impressed by the brands in the shop, although they were well known. Many of them looked cheap and nasty and even the better brand was mostly plastic. The knobs felt uncertain and the dials weren't smooth moving. They all had far more stitches than I want. I am not interested in heirloom embroidery or similar. I want basic stitches for woven and knit materials, a good buttonhole and a few other features. I think I will have to get my Husqvarna serviced. When I bought it, the manual said not to adjust the tension. It's not a happy machine. The stitch length is skipping and variable and the tension is occasionally in a knot. Literally. My problem is two fold. I'm not sure where to take it here to get it serviced. It was bought at David Jones in the city. The second problem is that I need to ask DIL to take it for me as I don't have a car and there's no way I'm carting it around without a car. I think a service would probably not be as expensive as buying a machine of the sort I'd like. 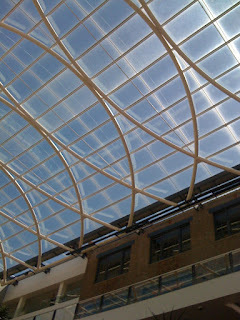 The picture shows the roof trusses and reflections of the roofing at Birkenhead Point over what used to be an open area. Here's a beautiful belated birthday present - an amber necklace, made from pieces of amber goodness knows how old. This is amber from the Baltic Sea, but when I did some research, I found that amber has been found fairly recently washed up on the eastern shore of the Gulf of Carpentaria in far north Queensland. There are a couple of commercial sites for it and some scientific sites as well. I find it beautiful, warm to the touch. The beads are not identical, some are fat and others almost flat. There aren't any insects caught in this amber although many of the beads have traces of what could be insect legs or tiny threads of bark or something similar. It's a good length, neither too short or too long. I like the contrast in times. The necklace made of ancient amber is hanging from my up-to-the-minute LED daylight lamp with its elegant curved design. The second picture shows some of the beads at closer range and if you look carefully, you can see tiny pieces of organic material trapped inside the solidified resin. I'd love more of this, but I don't wear a great deal of jewellery although I have some lovely pieces and amber is quite expensive. Pieces of just amber can be bought but I would then need to pay for design and making. So I can enjoy this bit and dream of other pieces. Last week I unexpectedly minded three of my grandchildren when their school holiday child minding arrangements collapsed. I had a frantic call from my son about 10:00 pm wondering if I could have them the next day. I would have preferred to have gone to their place. However I had a delivery booked for somewhere between 8:00 and midday. It arrived at 11:55! So they arrived here bright and early so son could get to an important meeting at his work. Master 12 wondered if I had a football he could kick around here while we all waited! Well, no! Three days before, I had ordered two felt brooch kits from Cam at Curlipops. They were intended to be a stocking filler for Miss Nine and her cousin at Christmas. They arrived really quickly so I took them out. Miss Nine is good at many crafts and set to to make her brooch. She quickly cut out the pattern pieces for the petals, traced them onto the felt and cut them out too. Cam's sample has the edges of each petal sewn down with a running stitch, but she decided she like hers so they could bend up like real petals. Her brooch didn't take her long at all. Miss only just Seven required more help. She needed help cutting out the pattern as the smallest petal has tight curves and I didn't have child sized scissors. Then I helped with the felt too. So the photo shows Miss just Seven wearing her brooch, She was very proud of it and they both liked the colours. I've packaged up the pieces and pattern from these so we could make some more with more felt bought. Miss Nine intends to pin hers to a hairband. I've just about given up on the catkin shawl. I spent most of yesterday afternoon trying to move the other second section. I had the right number of stitches, I'm accustomed to using a chart. I understand the principle of a pattern repeat marked out with a border on the chart. I've used it in several shawls. I can't get it to work out in real life. I did it about six times and undid it about six times. I think I am going to abandon it and substitute another pattern. Then again, I might just put it in the naughty corner till I forget yesterday's frustrations and have another go. I love the brooch idea. Kids are so fun to do craft with. I've missed seeing you at St Luke's! Good luck with the sewing machine, whatever you decided. Glad you had a happy time at BSODL, maybe they are making an effort?? The amber necklace is beautiful, My friend has lots of amber and I can really see an insect inside one piece. Very exciting. Oh the brooch is so pretty, what a nice way to spend time with them, without the footy though!! Skipping stitches could mean you need to replace the needle! But a service certainly won't hurt! You will find that there is a vast difference in price between the basic machines and the quilting/embroidery machines. I didn't want all the feautes that are on mine but I did want the wider throat. I went to S. store today. Lesson learnt: don't take DD!! LOL I will post about it later in the week. The amber is beautiful - it's amazing stuff isn't it? You could try calling Gareth - 0417669813.